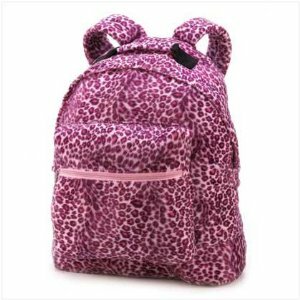 Plush, lush, and totally in step with today’s hottest looks, this fabulously furry Leopard backpack will make your friends purr with envy! Roomy enough for plenty of possessions, with a front zipper pocket and comfy padded straps. Weight 1.2 lbs. Polyester and cotton. Spot clean only. 13″ x 6″ x 16″ high. 13 in. x 6 in. x 16 in. high.